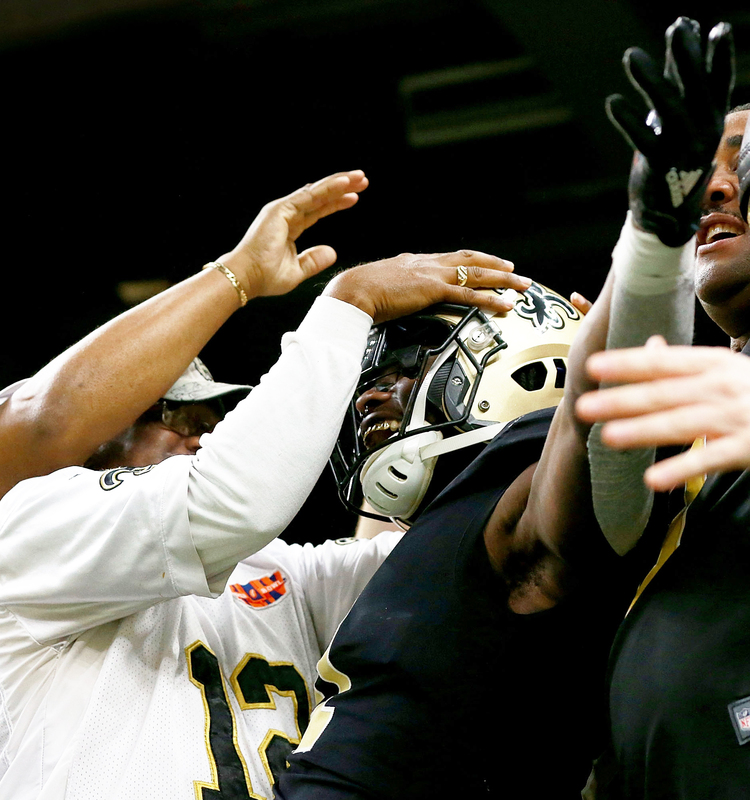 It’s Christmas Eve, and four hours have passed since the New Orleans Saints beat the Atlanta Falcons, 23-13, to clinch the franchise’s first playoff appearance in four seasons. 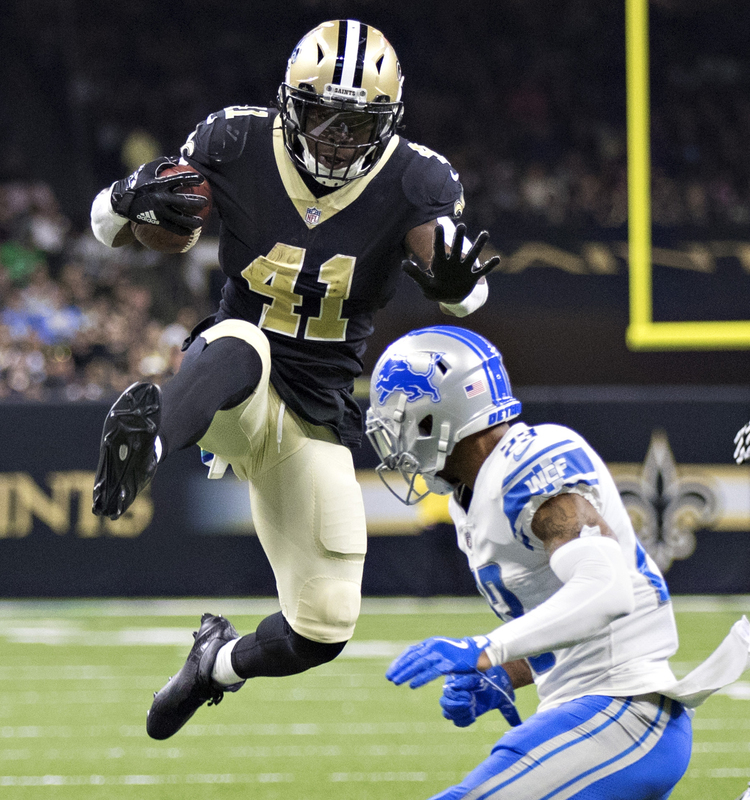 For Kamara, the Saints’ 22-year-old running back and the NFL’s runaway favorite for Offensive Rookie of the Year, the moment calls for some reminiscing about the journey. A music executive everyone calls “Coach K” is the man who gave the trio a chance, and to Kamara, Kevin “Coach K” Lee is his uncle. Coach K — who has managed the careers of Young Jeezy and Gucci Mane, and who is credited by The New York Times as taking Southern U.S. black culture global — is about keeping family close, and keeping it winning. Kamara is the first and only athlete to be represented by Solid Foundation, a sports management division of Coach K’s Quality Control record label. 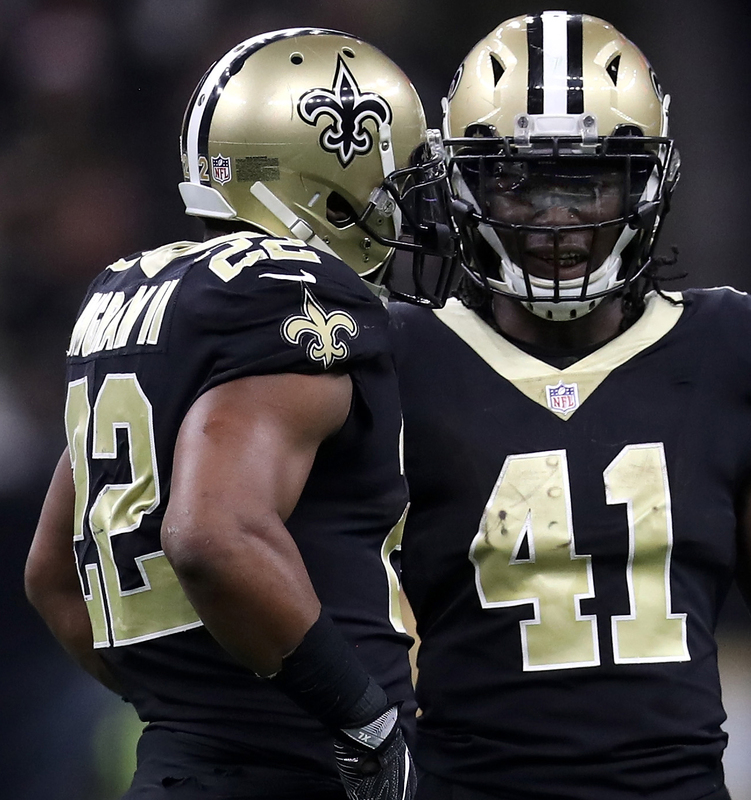 And with a strong and close-knit support system, Kamara, a Pro Bowler and seven-time league Player of the Week, has revitalized the culture of the Saints, the city of New Orleans — and perhaps, in a tough year, of the NFL itself. And those high school homies? They’re now known around the world by their rap names — Quavo, Offset and Takeoff, aka the No. 1 hit-making, Grammy Award-nominated Migos. “It’s dope to see the growth,” Kamara says. “Seeing them come up from nothing.” In 2017, the Migos emerged as the world’s most influential rap group, perhaps the best since OutKast. True indeed. In his first season in the NFL, Kamara has averaged 7.7 yards per offensive touch, more than any player in league history (minimum of 200 touches). Not since Gale Sayers in 1965 has a rookie scored five rushing touchdowns and five receiving touchdowns in a single season — until Kamara. And Kamara’s ballsy, fake-kneel, 106-yard kick return for a touchdown in the regular-season finale is the longest play in Saints franchise history. No other NFL player in the league is doing quite what he’s doing, and no other player looks quite like him either. In addition to wearing his hair in twists, he rocks two nose rings and a shiny gold grill in his mouth — on the field. And off of it, Kamara has plenty of gold around his neck, Louis Vuitton on his wrists and Alexander Wang on his feet. In a season polarized by protests, and missing star New York Giants receiver Odell Beckham Jr., Kamara brought swag to the NFL. He might even mean as much to the culture as the Migos right now. Nine long rings on the call to Quavo, and no answer. The recruitment of Alvin Kamara resulted in offers from just about every powerhouse college football program. On national signing day in 2013, with his mother, Adama, and Coach K beside him, Kamara decided to roll with the Alabama Crimson Tide, the school that once sent him 105 letters in a single day. He made the announcement during a crowded news conference at Norcross High School. And those high school homies? They’re now known around the world by their rap names — Quavo, Offset and Takeoff. It may have helped that somewhere along the road from Tuscaloosa to Knoxville, Kamara embraced who he is, especially with regard to his personal style. His middle school classmates had called him, as Kamara puts it, “weird as f—.” But ever since, he’d run from himself. It was time to return. 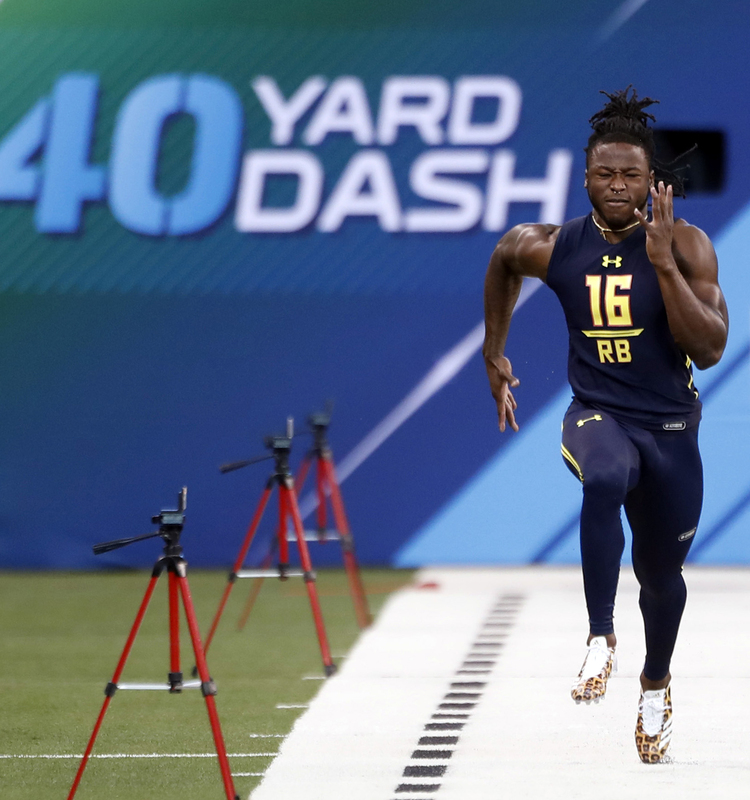 Alvin Kamara runs the 40-yard dash during the 2017 NFL combine. Kamara pondered: Just because I know some people? I’ve not made one song. If I wanted to be a rapper, I would’ve been doing that a long time ago. After the interview, the team’s running backs coach approached Kamara and confirmed what the prospect already suspected: The owner didn’t believe Kamara “loved football.” And that it was unlikely Kamara would be listed on the team’s big board come draft night. The interaction begged questions: Does a person have to “need” football in order to love it and play at the highest level? And can one love football and possess a full identity outside of it? Kamara’s flair may have been lost on some owners and front-office executives, but not on JR Duperrier, a sports marketing manager for Adidas. He had gone to the combine to sign former Michigan star Jabrill Peppers. When he got to Indianapolis, he found Kamara. Adidas announced the signing of Kamara on Twitter, 17 minutes after the New Orleans Saints selected him in the third round of the 2017 NFL draft with the 67th overall pick (63 spots behind Fournette, 59 behind McCaffrey, 26 behind Cook and 19 behind Cincinnati Bengals running back Joe Mixon). For Kamara, his pre-draft gathering was a blur. Just a simple chat with head coach Sean Payton and running backs coach Joel Thomas. “They weren’t pressing me,” Kamara says matter-of-factly. Something about the Saints just felt right. When he reported to the team’s training facility for the first time, he noticed it again. Saints running back Alvin Kamara jumps over Darius Slay of the Detroit Lions. Maybe it was how defensive end Cam Jordan, a three-time Pro Bowler, greeted him for the first time. “This man got a nose ring! You f—ing millennials!” And the first time he met Drew Brees, the future Hall of Famer knew about Kamara’s skills, and recognized the potential. “ ‘I wanna work with you,’ ” Kamara recalls Brees saying. “ ‘Let’s grow together.’ ” Brees and Kamara have found common ground and channeled it into a rejuvenated winning culture in New Orleans. “He always seems like he’s having fun,” says Brees, “and he definitely has a swagger to him. He fits in great with our locker room.” Throughout his first months in that locker room, Kamara won the rookie Halloween costume contest. He treated his offensive line to surprise rib meals in their lockers for helping him win FedEx Ground Player of the Week. And he sat on a throne of Airheads, a candy partnership Kamara had in his sights on since the draft. He always carries a pack of the taffy with him, offering some to anyone who crosses his path. Most notably, Kamara has established a playing and personal relationship with the veteran of the backfield, Mark Ingram. The rookie has become what New Orleans calls the “zoom” to Ingram’s “boom” in games, after which the pair conduct hilariously informative postgame interviews together in front of their adjacent lockers. This season, they became the first running back duo in NFL history to each record 1,500 yards from scrimmage. Alvin Kamara (right) and Mark Ingram talk during a game against the Atlanta Falcons. He took the advice to heart: 1,554 total yards from scrimmage through 16 regular-season games. He also owns the highest yards-per-carry average (6.1) for any first-year rusher in the Super Bowl era (minimum of 100 carries) and broke a 36-year-old franchise record for most touchdowns by a rookie, with 14. Simply put, Kamara got all he could ever ask for in his first NFL team. Because the Saints let Alvin be Alvin. It’s a party in Suite 354 at the Superdome — jam-packed with Kamara’s people. “I just got here,” says Coach K, fresh off a private jet to see his nephew play. “All he had to do is play ball when he got here. Be young. Bring the swag. Do his thing.” Quality Control co-founder Pierre “Pee” Thomas is there, along with David Raymond and Duperrier. New Orleans rapper Young Greatness is rocking a custom Alvin Kamara hoodie, created by the designer/stylist Tvenchy, who’s responsible for many of the rookie’s day-to-day outfits and is in the suite vibing as well. Alvin Kamara celebrates with fans after scoring a touchdown against the Carolina Panthers. Hours after the walk home, New Orleans is abnormally quiet, save for the few packed restaurants. A Kamara and Quavo FaceTime happens, as the Migos’ genius sits in a glowing Atlanta studio and chops it up about jewelry and such — “Show me the ice!” he says — with the NFL’s most explosive offensive weapon. After the call, not even the star rookie running back of the Saints can secure a last-minute reservation downtown on the night before Christmas. So it’s into his black Audi S7 V8T and on to a chicken wing joint on the outskirts of the city, where he’s perhaps even more heralded as he places a food order fit for an army. It’s apparent that the stone-faced cashier sort of recognizes him, though she can’t fully put her finger on the exact identity of the nose-ringed, beanie-wearing figure before her. “We need that Super Bowl!! !” a middle-aged man shouts.